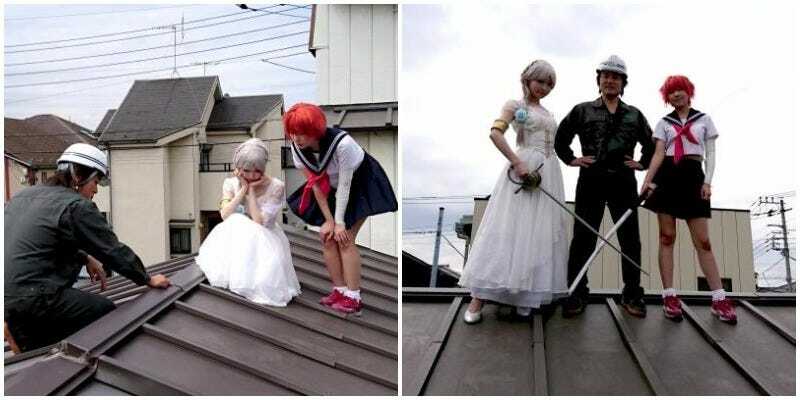 For a limited time only, a Japanese roofing company has started a new cosplayer service for customers. Nara-based roofing company Mori Kenchiku Bankinkogyo is rolling out an “On the Roof Cosplay Counter-Plan Service” for customer consultation. The company wonders if this is the first of its kind in the world. I think that’s a safe assumption. The cosplayers won’t be mending roofs (they’ll leave that to the pros), but according to Biglobe News, they will be getting up on the roofs to help take some of the anxiety customers reportedly have about free consultations for fixing leaks or renovation. Apparently, that is a problem for some, who would like a more informal consultation. Who knew? The free service is limited only to ten customers. First come, first served.